Conspiracy theorists are accusing Google of manipulating their search function to favour the Tories. Somebody discovered what happens when you enter the UK's major political parties into Google, and people aren't too happy about it. 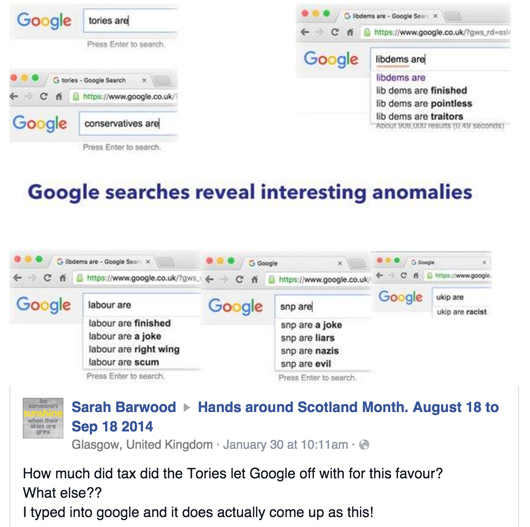 Facebook user Sarah Barwood shared the picture, which the caption: "How much did tax did the Tories let Google off with for this favour?" What the screen grabs seem to show is that Labour, Lib Dems, SNP and UKIP get absolutely killed by Google's suggested search, while the Conservatives seem to get off scot-free. We didn't believe it, so we of course tried it for ourselves. Have you tried searching it?